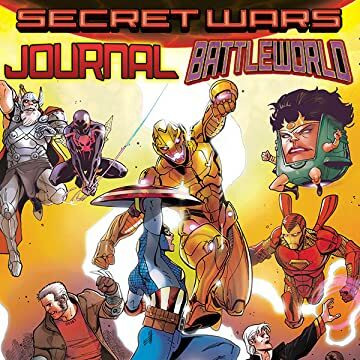 Collects Secret Wars Journal #1-5, Secret Wars: Battleworld #1-4, Howard the Human #1, Secret Wars: Agents of Atlas #1. Tales from across the landscape of SECRET WARS! Is Lady Kate of 1602 the notorious Hawkeye Bandit? Can enslaved mutants overthrow Khonshu? Kraven hunts, Matt Murdock cooks, Wolverine investigates and Doc Samson tries to bring sanity to a land of Hulks! The Punisher and Iron Fist! Night Nurse! MILL-E: the model citizen! Plus: Fights, fights, fights! A Doctor Strange-possessed Frank Castle against the New Fantastic Four! Cowboy Deadpool and Devil Dinosaur! Silver Surfer vs. Maestro! Wolverine vs. Wolverines! All the M.O.D.O.K.s! 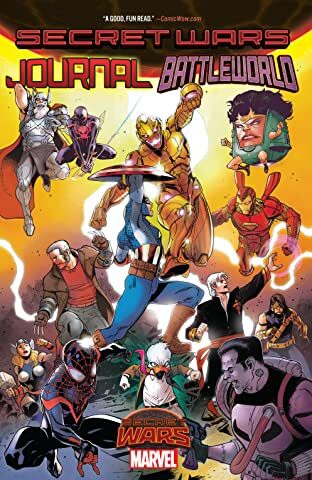 The Agents of Atlas rebel against Baron Zemo! And pity poor Howard the Human, trapped in an anthropomorphic animal realm he never made!